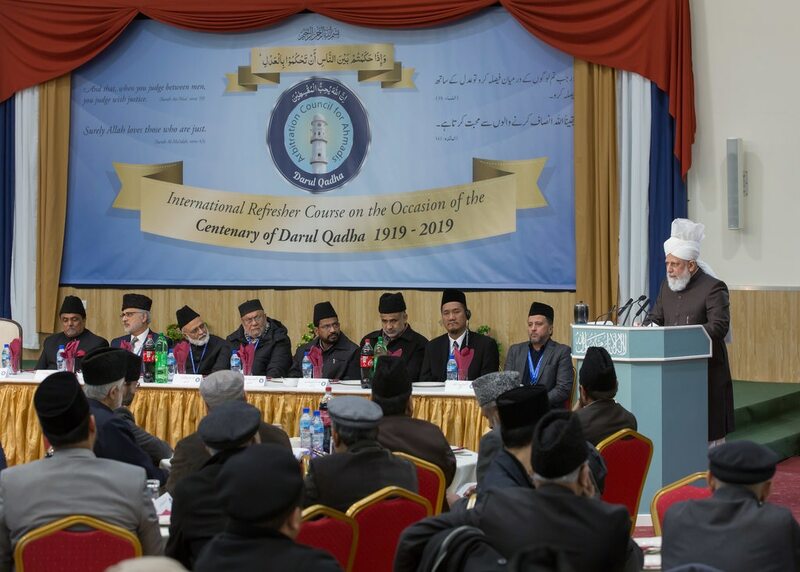 On 20 January 2019, Hazrat Mirza Masroor Ahmad, Khalifatul Masih Vaa delivered the keynote address at the International Refresher Course for the Ahmadiyya Board of Arbitration (Dar-ul-Qaza) that marked 100 years since the organistaion’s establishment. 114 representatives of the Qaza attended from 15 countries for the weekend-event held at Baitul Futuh Mosque, London on 19-20 January 2019. UK (22), Canada (11), Denmark (3), Holland (4), Norway (3), Pakistan (9), Switzerland (2), Germany (29), Bangladesh (1), USA (21), Australia (2), Indonesia (3), Belgium (2), India (1) and Mauritius (1). After tilawat and its translation, Sardar Muhammad Rana Sahib, President of the Qaza Board Pakistan presented a brief report of the two-day refresher course followed by a vote of thanks by Dr Zahid Khan Sahib, Sadr Qaza Board UK. This led to the highlight of the event: the concluding address by Hazrat Khalilfatul Masih Vaa. 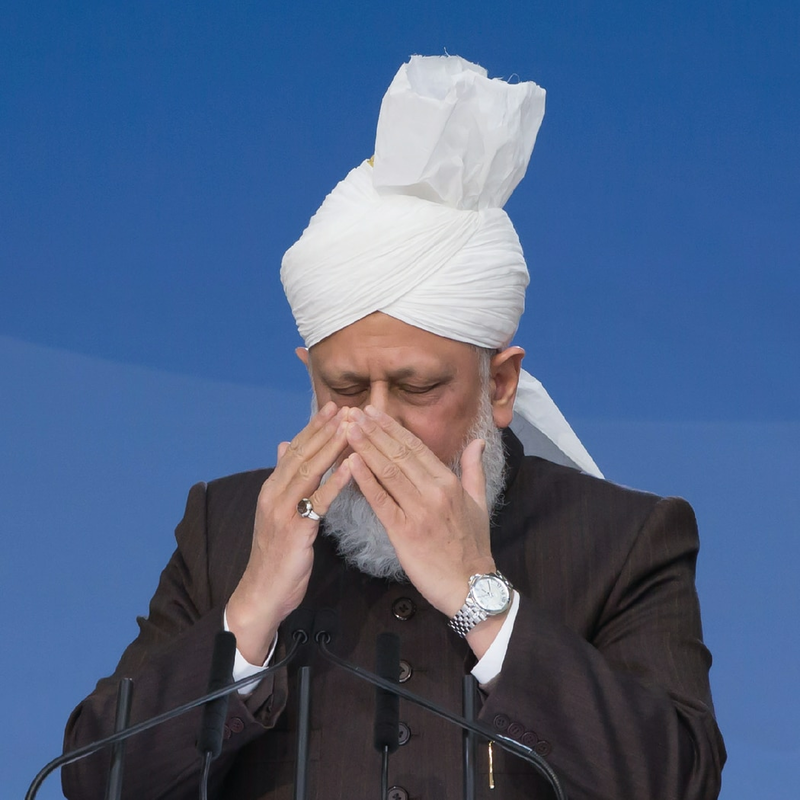 During his address, Huzooraa drew the attention of the attendees towards fulfilling their responsibilities as arbitrators, according to the esteemed standards of justice and truthfulness outlined in the Holy Quran and by the Holy Prophet Muhammad, peace and blessings of Allah be upon him. Hazrat Khalifatul Masihaa said that this verse contains detailed guidance and exhorts the readers to keep in view that God Almighty is aware of what is in people’s hearts. Decision makers, in particular, therefore should deliver their verdicts and opinions with complete sincerity and maintain the highest standards of integrity and impartiality at all times. Huzooraa said that the Holy Quran requires such standards of justice that a person must be ready to testify against himself or his close relatives in order to uphold the truth. Hazrat Khalifatul Masih Vaa said that the demands of justice required for the members of Dar-ul-Qaza to be truly God-fearing. Furthermore, it was necessary that each arbiter analysed the facts of each case carefully and prayed sincerely before reaching a decision. During his address, Huzooraa drew the attention of the organisers to arrange for the proceedings and the lectures delivered to be produced in print form and circulate it to those who were unable to attend in person. The event concluded with a silent prayer, followed by dinner and photographs with the delegates. The concluding session of this historic event will be shown on MTA International and will be available to view at www.mta.tv/ondemand.